Nutrition is the bogeyman to most athletes. You know he’s always looking when you’re not. He’s messing with stuff that you just put down and now you can’t find it. He’s hiding under the bed to wake you up as you just start to drift off to sleep. You know he’s always waiting for you, you just can’t ever figure out where or how to catch him. I’m going to work on demystifying nutrition for a few categories of regular old day-to-day hard-working CrossFitters. The first article will be for the newer athlete who is really interested in fat loss and feeling better in day to day life. We’ll focus on food quality, an extra simple way to measure portions, and staying hydrated. The second will be for the metabolic monster who wants to be a fire breathing CrossFitter. Here we’ll get into fun stuff like carb cycling and nutrient timing. If you think you’re in that category and you aren’t doing the basics from the first article, you aren’t in the fire breathing dragon group yet. Get the basics under control and then work on more advanced methods. The third will be for the ecto-athlete who really wants to add some quality mass to their frame. Read it if you’ve ever told someone, “I eat a lot and I can’t gain weight.” We’ll talk about the window of gains and how much you really have to eat to get bigger. All of it will be very simple, straightforward advice that works because you can actually do it. So next time you feel like food is the bogeyman and you aren’t making the progress you want because you feel like you can’t make the “right” choices, you can refer back here for some solid tips! This is the 2nd hardest stage of working on nutrition. The hardest comes right after being a newbie when you have access to lots of information but lack the experience to discern what is useful to you specifically. Both groups really benefit from having a coach who is a great teacher to guide them through the beginning stages of building a healthy lifestyle while avoiding common pitfalls and rookie mistakes. The simplest way to start on any nutrition adjustment is to figure out where you are now. Like right now, not your fighting weight. That allows us to look for low hanging fruit and make simple lower effort, high impact tweaks to your initial plan. If you’re drinking a half-gallon of soft drinks per day, you’re consuming more calories than you could hope to burn through exercise. Some typical early tweaks I’ll suggest revolve around replacement rather than removal. If you’re getting too many soft drinks, we’ll try to replace some or all of them with water. If caffeine is an issue, we’ll go to green tea or coffee to work towards independence. If it’s carbonation, we’ll look towards flavored sparkling water to keep the fizz afloat. We might also look at small additions to the daily plan. Consider adding 2-4 servings of fruit and vegetables daily if you pretty much only food out of boxes and drive throughs. I’ve seen that simple tweak result in lbs dropping off with little other intervention for beginners. Some simple guidelines to eating start with 1-2 palm sized portions of lean protein, 1-2 small cupped handfuls of something starchy or fruit, 1-3 fist sized portions of vegetables, and 1-2 thumb sized servings of fat. That will serve the typical new CrossFitter reasonably well without requiring a food scale and measuring cups to accompany you to dinner downtown tonight. It isn’t going to be the “perfect” plan that’s tailored exactly to your needs, but it will serve as a decent guideline to try out in many cases. In every case, what you can do is better than what you should do. The “perfect” plan abandoned in 3 weeks never accomplished anything but reinforcing the idea that you “can’t” do it so why try again. The main thing is to keep the main thing the main thing, as Stephen Covey famously quipped. Don’t make a nutrition plan about following a nutrition plan. That should come with the sign, “Abandon hope all ye who enter here.” Make a nutrition plan about serving larger life goals like loving your body and giving it nutritious foods that will help you to think more clearly and feel better. If this post is really just confusing and you’d like a teacher to work with you on the concepts, you can always drop me a line at [email protected]. Nutrition can seem like the bogeyman, but it doesn’t have to be. I’d love to help you demystify your food and get you moving towards nutritional independence! 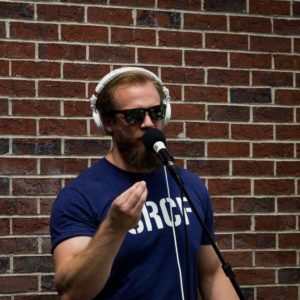 When he’s not asking why or saying it depends, Brandon is trying to pick up progressively heavier things and recording the disruptivecast, a strength and conditioning podcast. He loves working with athletes 1 on 1 to teach and correct movement, helping them do things they didn’t even know were possible. Brandon is a Precision Nutrition certified nutrition coach who serves clients with a light touch understanding that making big life changes is tough and having someone in your corner makes a huge difference.